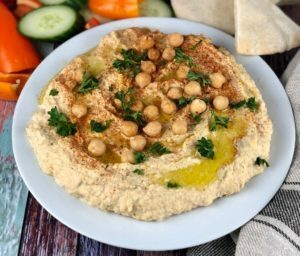 A creamy flavorful combination of items you probably already have on hand – chickpeas, tahini, lemon juice, olive oil, garlic and spices. If you don’t have tahini on hand, get some. It will last for several months after opening if stored in the refrigerator. Some recipes call for the skins to be peeled off the chickpeas to create a creamier consistency. I found peeling the skins to be very time consuming and really didn’t make the hummus noticeably more creamier. 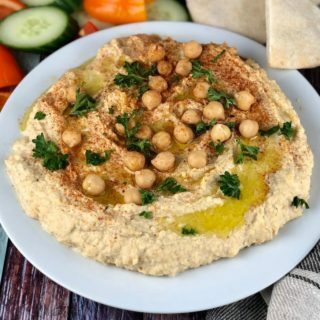 What does make the hummus creamier, is processing in a food processor a few extra minutes. Omit the paprika and parsley in this recipe and try topping with diced roasted red peppers, roasted garlic cloves or my Everything Seasoning. Great served with warm pita bread or fresh veggies. This classic creamy hummus recipe comes together in a few minutes with ingredients on hand. Serve with warm pita bread or fresh veggies. Drain and rinse chickpeas. Set aside 2 tablespoons chickpeas to use later as a garnish. In a food processor, combine the tahini, water, 2 tablespoons olive oil, garlic, cumin & lemon juice and salt. Process for 1 minute. Add the chickpeas to the food processor and process for about 4 minutes, scraping down the sides after each minute. Taste and add additional salt if necessary. If the consistency is too thick, add a couple additional tablespoons of water and process for another 30 seconds. Spoon the hummus onto a platter. Drizzle reserved 2 teaspoons olive oil on top, sprinkle with paprika, parsley and top with reserved 2 tablespoons chickpeas.